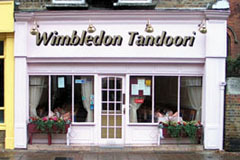 Dine on the finest of Indian cuisine at the Wimbledon Tandoori in the tastefully decorated and comfortable restaurant. The menu features traditional Indian favourites including Persian dishes and is complemented by an excellent range of unusual and delicious specialities. The chefs at the Wimbledon Tandoori will be pleased to prepare a dish of your choice if it is not listed on the menu. Open every day 12-2.30pm and 6-11.30pm. All major credit cards accepted. No service charge. Tandoori, Balti, Meat, Seafood and Vegetarian dishes, a selection of Persian Dhansak dishes and a range of Chef Specialities.